From the most basic of copy functions, to the most complex scan jobs, the monochrome Advanced Series will perform them with ease and efficiency. Walk up to the control panel, and the machine senses you approaching and automatically wakes up. Within seconds from the time you place your originals in the feeder and select your settings, it's ready to print. Use one of the Easy Modes for fast, simple operation, with basic functions displayed in large, clearly-labeled tiles and keys. And for more advanced features, just touch the "Details" button-it's that easy. Connecting a multifunction printer (MFP) to your wireless network and accessing it from mobile devices has never been so easy with the monochrome Advanced Series' standard wireless networking features. Print from or scan to popular cloud services such as Microsoft OneDrive® for Business, SharePoint® Online, and Google Drive™ with Sharp's Cloud Connect feature. Single Sign-on (SSO) support for accessing these services makes scan-to-folder and scan-to email operations simpler than ever. Even printing from your desktop is made easier with Sharp's Serverless Print Release function. Easily send a job to one device, and print it on another when and where it's most convenient for you. 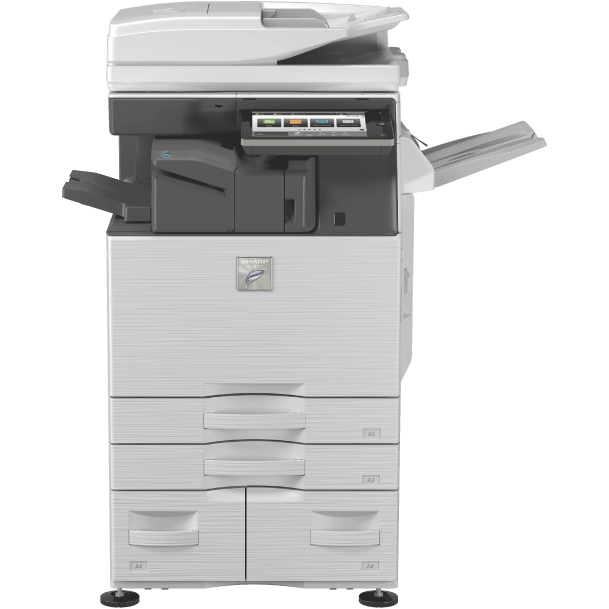 When it's time to get the job done, the Advanced Series monochrome document systems are outstanding performers. Quickly scan documents at speeds up to 200 images per minute. Built-in optical character recognition (OCR) can convert your scanned documents into text searchable PDFs or Microsoft Office file formats, simplifying your workflow. Use the manual stapling feature on select finishers to restaple your originals. Multiple finishing options give you the output you require, be it stacked, stapled or saddle-stitched. There's even an available built-in stapleless staple feature, which can bind up to five sheets of paper by adding a crimp to the corner of the set, saving regular staples for larger sets.